When the founders of Immanuel Church got together in early 1877 they selected this name as both a statement of faith and a reminder of God's constant presence. The first Immanuel services were held in February of 1877 and the church was formally organized in May of that year. A church building was constructed and the church and Christian Day School began using that building by October of 1877. About 10 years later a second church was constructed and the first building was used for the school. In 1900 a third church building was constructed. That building was used by Immanuel until 1993 when the new Immanuel church building on Church Street and Pearl City Road was completed. The old church (615 S. Chicago) was sold to St. Martin Missionary Baptist Church and is now being used by Philippians Missionary Baptist Church. The new Immanuel Lutheran Church building (1993 W. Church Street) was dedicated to the glory of God and for use for Christian worship, fellowship, education and ministry on December 18, 1993. It includes the spacious sanctuary, a large narthex (foyer), a balcony on the upper level, a library, a family life office, a nursery room, a youth room, offices for the pastors and church secretary, a Fellowship Hall and a spacious church kitchen. A bell tower and entryway was added in 1996 and a classroom addition to the school was dedicated in 2000. Construction of the new church was under the leadership of Gerald Crouse (Building Chairman) and his twelve member building committee, Ray Johnson (Construction Consultant), and Jim Miller, architect of Abris Limited at Urbana, Illinois. The Christian Day School, Immanuel Lutheran School, has always been one of the key "missions" of the church. Lutheran School classes actually predated the formation of the church. When the church was organized the Christian Day School began classes in the fall of 1877. In those days the instruction was in both the German and English languages and one of the concerns was preservation of this heritage as well as instruction in the Word of God. With changes in the country the instruction in the German language was eventually dropped, however, the instruction in the Word of God and Prayer continues to this day. In recent years the congregation has become more convinced of the value of the ministry of the Christian Day School for all Christian families and welcomes and encourages parents and students from many different Christian denominations. Currently, nearly 200 are enrolled with openings in several grades. At first, the church and school met in the same building. Then a new church was built and the first building was remodeled. This remodeled building continued to be used until 1923 when a new large school building was constructed on South Chicago Avenue. At the time it was a "state of the art" school with four large classrooms and a gymnasium and even included a bowling alley, a movie projection area, and a soda stand. The old school building (514 S. Chicago) was sold in 1985 to the Freeport Area Church Cooperative and continues to be used by this community organization. Architect Jim Miller designed the new Immanuel church to both complement and contrast with the existing school building. The congregation decided to construct a two-level building because of the lay of the property and the need to construct a structure with as much height as possible. The brick chosen was slightly darker than the brick of the school building. The insulcrete, a modern stucco substitute on the exterior, is the same material used on the crosses in the windows at the school. "Shangles," a three dimensional shingle was chosen to give a richness to the roof. It was decided to include stone on the south entryway as well as in the altar area for beauty, strength and depth. Dozens of windows on each side of the church building on both levels provide natural lighting and an "uninstitutional" feeling. The cornerstone on the southeast corner of the new church carries etchings of the three church buildings that Immanuel has used over the years. It is filled with memorabilia of the history of the congregation and the construction of the new church. The north side of the building has three crosses to recall the crosses of Calvary. They remind us that Jesus died on the center cross in payment for our sins while the thief on one cross was unrepentant and the thief on the other cross threw himself on the mercy of Jesus Christ. Landscaping around the church is part of a plan to provide natural beauty to the new structure. Many of the items have been donated as memorials and special gifts. The long range landscaping plan includes additional plants as well as ideas for a small grove or flower garden on the west side and also in the area between the church and school buildings. One of the striking features of the new Immanuel church is the stained glass. There are four triangle shaped stained glass windows which draw our attention up to lofty thoughts of our Lord. During the day they are observed from within the sanctuary with the beauty of the sunlight. At night when light is focused on them from within they make a dazzling statement to those observing in the area surrounding the church building. The windows were designed by City Glass Specialties Company in Ft. Wayne, Indiana, under the guidance and direction of Immanuel's Fine Arts Committee and its chairman, Dan Edler. The primary design characteristic of all the windows is, first and foremost, very high quality composition. The compositions are abstract, concentrating on the elements of art. They use Christian symbolism and reflect some of the shapes in the interior structure of the church. One of the key principles of the designs is the expression of movement. North Window. The window above the altar is the "God the Father" design and features the caring, helping, loving, open hand of God. We think of His "hand" extended to us from the firmament of heaven to the earth, bringing order and shape to the universe. This is also the hand that created us in His "own image." In this window we see symbols for God's great and powerful forces collecting together the stars and shaping the earth. The stars and forces of His glory radiate in all directions. Sweeping dark lines combine with rich color, producing a sense of movement. Note that God's hand is an open hand, ready to give and to guide. His hand is before us to remind us that He lives and that His promises will not be broken. This is the truth that will be with us for all eternity. West Window. The window to the west (to the left as you face the altar) is the "God the Holy Spirit" design. In this design the Spirit in the form of an abstract dove trailing the flames is a symbol for the transfer of that Holy Spirit down to us. When the sun is right, one is struck by the projection of the window's colors across and through the sanctuary. It could be taken as the Spirit casting its warmth and peace on the church and on the people who worship here. It incorporates symbols of fire extensively, playing on the variations from wide to narrow. The fire is straight and curved, directing through the window. The Spirit window is a strong dramatic design to remind the worshiper of the strength and power of the Holy Spirit. The composition also plays with color in its variations and subtle changes to heighten eye appeal. East Window. The window facing the east (to the right as you face the altar) is the "God the Son" window, also known as the "Lamb Window." It depicts the risen Lamb of God portrayed as the victorious lamb--the risen Christ. His victory banner with the red cross is over the shoulder and a cross of the crucifixion is behind. The scene takes place within a surround shape somewhat symbolizing the tomb. Bursting out from his feet are the red rays of hope for humankind. All of this is played out among a delightful gift of color and sweeping lines similar to our other windows, keeping them all within the same compositional feeling. The Lamb of God window is a bit more realistic in its approach to the subject. The red rays of hope give us an interesting straight line shape in relation to the other curving lines. This is a design feature that separates this window from the others. There is an exceptionally good use of red's many variations. Perhaps in this way it also reflects the agony of Christ's crucifixion. South Window. The south window (facing the school) depicts what is called the "Means of Grace," the ways in which God blesses His church on earth. Once again, the idea of movement is expressed in the "wave" that is evident toward the bottom of this window. God's gifts of Word and Sacraments are freely offered to us in a wave of blessings, not unlike the waves of manna and quail that fed the children of Israel in the wilderness after the Exodus. Central in this design is the host and chalice. High and to the left of center is the shell symbol with the blue waters cascading down, washing clean in Baptism. Curving from right to left across the bottom of the design is the Lamp of Knowledge. Thus, through Baptism, Communion, and the study of God's Word do we receive this grace. These symbols are cast in a background of the Cosmos. Lines of force and beautiful colors help create in the mind's eye the glory which is His alone. These lines move the eye through the composition and bring one to enjoy the beauty of this window's color and the profoundness of its symbolism. Our sanctuary is in the shape of a cross with the focal point on the altar. The furnishings in the sanctuary include the pews built by Gunder and Company of Humboldt, Iowa. They are built of Red Oak and the custom design of the pew ends correspond to the motif of the chancel furniture designed by our architect. The extensive use of white in our church on the walls, vaulted ceilings, and lighting globes give a feeling of brightness, joy, and life. The multi-colored carpet in the sanctuary and narthex offers a rich feeling without being ostentatious. The "amethyst" colored pew cushions and Communion kneelers complement the other colors in the church. The lines of the altar area are reflected in the pews and also in the custom designed narthex furnishings which were also constructed by Gunder Company. The chancel furniture was designed by the architect, Jim Miller, and constructed by Tom Sorg of North Grove Woodworking in Lanark. The bold free-standing altar in the center carries the six different liturgical colors of the day, the color depending on the season of the year. The cross behind and above the altar was designed by Dan Edler and also constructed by Tom Sorg. A matching processional cross was made in 2009 and presented as a memorial for a lifelong member. The wood carving of the Last Supper, created by an Immanuel member in 1937, is one of the items that was brought from the old church building. The pulpit to the left as the viewer faces the altar is a large and strong object which reminds the worshiper of the strength of the Word of God. To the left of the pulpit is the Baptismal "font." The shape of the "font" (a word referring to the fountain of water in Baptism) was designed by the architect. A Baptismal candle near the font is lighted for all Baptisms with a keepsake smaller candle presented to the Baptism family. The metal parts were supplied by artist Lee Peck of Sycamore. Lee's surface design on the lid and base is etched into the bronze with electroplated nickel and copper. It carries an aquatic theme with 13 fish, symbolic of the New Testament church, the 12 apostles, and the thirteenth apostle, Paul, the one "untimely born." We also think of the fish as a reminder of Christ's Baptism in the Jordan among the fish. To the right of the altar is the smaller "lectern," from which the Scripture is read, announcements are made, and informal thoughts and messages are presented. The Communion rail circles the chancel area and as many as 24 Communicants in "tables" of twelve can approach the altar at once. Kneelers are provided to assist the worshiper in reverent reception of the Sacrament of Holy Communion. Other chancel furnishings include the candelabra, clergy chairs, the national and church flags, the Processional cross, and the kneeling bench or "prieu dieux" used for weddings, confirmations, ordinations and consecrations. One of the most striking pieces of art in the chancel area is the carving of the Last Supper on the altar. It was carved by Gus Schultz, an Immanuel member, in 1937 and a version of this carving by this same man was on display at the Chicago World's Fair in 1939. The carving is a reflection of the Last Supper picture painted by Leonardo da Vinci between 1494 and 1498. Many artists have tried to capture this scene but Leonardo's is the most famous in modern history. The church's annual Holy Week drama is a fitting recreation of the scene depicted on the altar. The carving depicts the dramatic moment when Jesus says to His disciples the words, "One of you will betray me." (Matthew 26:21) In the carving Christ is the central figure and the disciples sit in groups of three each. In their bewilderment, they have drawn away from Him and Christ and sits alone. On the left (from left to right) we see depicted NATHANAEL (or Bartholomew) who had questioned, "Can anything good come from Nazareth?" (John 1:46), JAMES THE LESS who is little known but still a great servant, ANDREW who brought his brother Peter but who here has upraised hands in surprise at Christ's question, SIMON PETER who is leaning forward and touching John's shoulder and asking who the traitor is, JUDAS ISCARIOT who is clutching the money bag that held the betrayer's ransom, and JOHN, the disciple whom Jesus loved whose gentle features here suggest total bewilderment at Jesus' question. Continuing on the right side of Jesus (from left to right) we see depicted JAMES, the brother of John who was hoping for a place near Jesus, behind him, THOMAS who was known as the "doubter" and whose raised finger seems to be asking, "Is it I? ", PHILIP who is bending over his companions with deep regret and the same question on his mind, and MATTHEW, JUDAS THADDEUS, and SIMON THE ZEALOT who almost seem to be in a three-way conversation about what is happening. It is interesting that nearly all the hands point in the direction of Christ, some with conviction and others with nervous energy. Each disciple, including Judas, seems to be preaching a message to us by their hands, their facial expressions, and their bodily reaction to the statement, "One of you will betray me!" One of the concerns of Immanuel church in constructing the large narthex or entryway was the need for a place for Christian fellowship and encouragement. The narthex also can be used for Bible studies, meetings, fellowship times and other gatherings. A computer screen in the narthex publicizes events and activities of the church and school. Narthex furnishings include a registry stand, flower stands, seating benches, and tables. They carry the same theme as the furniture in the sanctuary and were designed by Immanuel's Fine Arts Committee and custom made for Immanuel by Gunder Company of Humboldt, Iowa. From time to time the narthex furnishings are used in the sanctuary itself. As the plans for the new church were being made there was much concern about Immanuel's organ, a 27 rank Reuter brand instrument that had been used since before the Great Depression. The organ itself had given the congregation little trouble over the years and was seldom in need of repair. It was rebuilt in 1950 and was due for certain work when the congregation was considering the new church. As the congregation considered its needs and also the changes in music and electronics it carefully studied the issue of whether or not to include the old organ in the new building. The decision was finally made to rebuild the organ and it was moved to the new sanctuary where it was installed in the balcony. Since the organ is what is called a "romantic organ" it was felt that some additional ranks were necessary to help the church with its music in the new century. Don Diestelmeier of Freeport Organ Company rebuilt and upgraded the organ, beginning in 1994. He revised the stop layout and added eight new ranks of pipes. The old two-manual console that dated back to 1941 was replaced with a three-manual console. The organ was first “officially” used on Easter in 1998 while work continued. Two more ranks were added, bringing the total to 32 ranks, with 1,830 pipes. 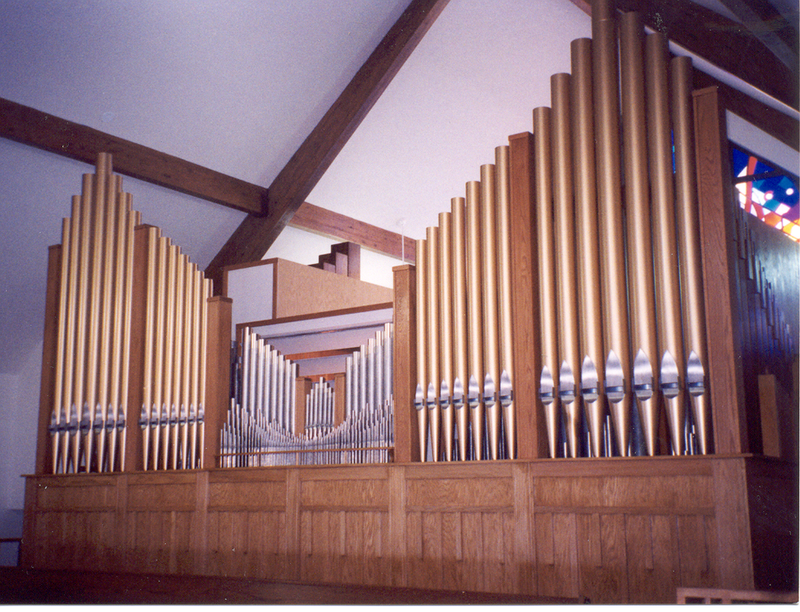 The organ was rededicated to the glory of God on February 27, 2000 with a special concert and gathering. As the visitor moves to the lower level of the new church one is struck by the amount of space in many different areas. There is a large fellowship room that can seat 150 or more for lunches, Bible classes, and other events. The kitchen to the north end provides space for fellowship lunches and meals. It was completed in January 1996. On the east side are two offices--a large secretary's office, an office for Vicar or DCE and a large office with a conference table for the Senior Pastor. On the south end are washrooms, a nursery, and a the Associate Pastor’s office (which was formerly the Family Life Office). The library on the south end is also used for piano and band lessons. On the west side of the building is the youth room and classroom. Regional furnaces and air conditioners provide heating and cooling with the best technology available.